I'm still renting, because I like my place, I'm paying a fair price in rent and I have a very ambitious goal of buying my home with cash when I am ready. Very ambitious. In case I'm not able to save up enough, my backup plan was to get a "no documentation" (or "no doc") mortgage from a reputable bank. With a no doc mortgage, the borrower generally has a very good credit score, and is only required to present the lender with a social security number and details about the property in question. These loans are often called "liar loans" because certain folks who go for them don't make enough money to afford the mortgage. But I'm not interested in a no doc because I don't make enough. I like the idea of the no doc mortgage because I have a high credit score and, because I'm self-employed, my income fluctuates. 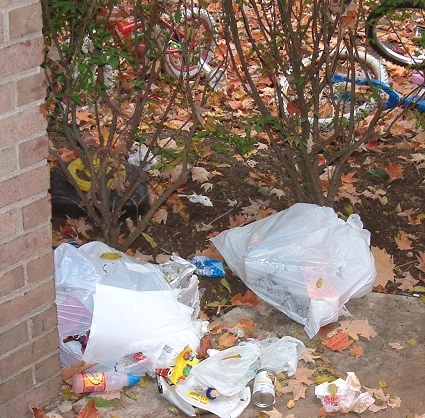 The hillbillies next door sometimes leave plastic bags full of trash outside, uncovered and unprotected, so the cats and raccoons get into it late at night and leave a disgusting mess. Soooo lame, especially because the dumpster is no more than 15-20 paces from their front door. This kind of despicable laziness just boils my blood. I've spoken to them about it in the past. They apologize and tell me that they'll clean it up, and about half the time they don't bother keeping their promise. So about two weeks ago, I started throwing cups filled with undiluted bleach on their side, on top of the mess, on the ground and on their door. That swimming pool smell of bleach doesn't bother me one bit -- it's the smell of clean, the smell of germs dying -- but it got to them. They asked me if I was throwing the bleach, and I denied it. I told them that I thought I saw some of the complex's groundskeepers doing something near their door. They haven't left trash outside since. Do I feel guilty about throwing bleach and denying it? Heck no! I should tell them that I threw the bleach so they can retaliate? I don't think so. All is fine now. No more trash everywhere, and they get to grow up a little.